As might be expected given their respective reputations, the 1920 merger of Sunbeam, Clement-Talbot and Darracq endowed the resultant STD Motors Ltd with a formidable engineering pool. Nevertheless, Sunbeam's chief designer Louis Coatalen drew on the services of former rivals Ernst Henry (ex-Peugeot), Vincenzo Bertarione and Walter Becchia (both ex-FIAT) in order to prove the new combine's competitive worth. The various STD grand prix and land speed record cars which emerged thereafter were campaigned under all three brand names depending upon marketing needs. Convinced that circuit-biased technology could and should be applied to roadgoing machinery, Coatalen oversaw the 1924 introduction of the Sunbeam 3 Litre Super Sports; a high-performance Bentley-baiter which utilized a dry-sumped, straight-six DOHC engine and chassis derived from its 16/50 stablemate. The latter had debuted at the 1923 Olympia Motor Show and was based around a conventional ladder frame platform equipped with all-round leaf-sprung suspension (semi-elliptic front / cantilever rear) and four-wheel drum brakes. More touring than sports orientated, the 16/50 was powered by a 2540cc OHV six-cylinder engine allied to manual transmission. Only listed in marque brochures for a single season the model racked up just 26 sales. However, rather than disappearing, the Sunbeam 16/50 metamorphosed into the Talbot 18/55 - an early case of badge engineering. Almost as short-lived as its `twin', the 18/55 was quietly dropped during 1926 when Georges Roesch's innovative new 14/45 began to gain momentum. A rare car in period, surviving Talbot 18/55s are few and far between. Finished in blue over black, this particular example is stated to have covered just 39,000 miles from new. Reportedly with its first keeper and his family for a remarkable seventy-eight years, the Talbot is understood to have spent a lengthy period in dry storage before entering the current ownership during 2004. Carefully recommissioned and refurbished by the renowned Beaufort Restoration Company at a cost of circa £30,000, the 18/55 is said to pleasingly retain its original upholstery (black leather front / Bedford Cord rear) and roof covering. Sporting twin side-mounted spare wheels and elegantly proportioned `D Back' limousine coachwork, `NF 1146' boasts such suitable accoutrements as a three-piece windscreen, well-stocked dashboard, wood-framed sliding glass division, braided silk pulls and occasional seats. 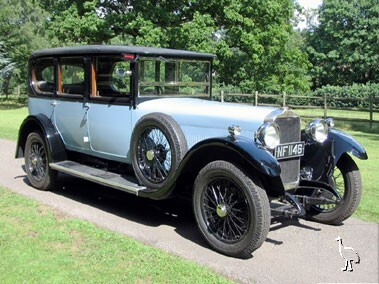 Riding on new wire wheels and tyres, this exceptional Vintage Talbot is offered for sale with original sales brochure, purchase receipt, file of correspondence and MOT certificate valid until July 2010.